Early each February a series of events take place to mark Setsubun (節分): the changing of the season from winter to spring. Traditionally this was a time to expel evil and prepare for the planting season ahead. Always a fun occasion, activities include the scattering of beans to purify homes and the driving out of devils from temples and shrines! At this time, scary masks and packs of special beans go on sale in shops all over Japan. A great place to experience Setsubun is Yoshida-Shrine (吉田神社) in Kyoto. 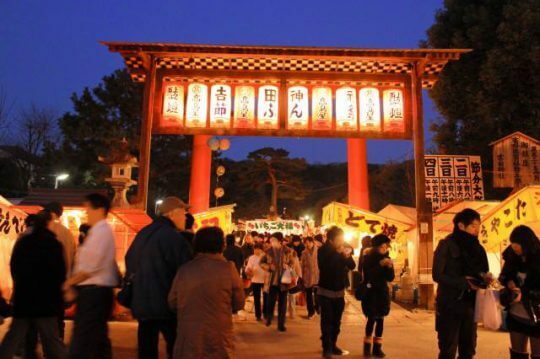 Located on a small hill to the east of the city-centre, this shrine holds an annual 3 day festival (Feb 2 – 4). Devils make periodic patrols of the grounds, clubs in hand, and roar at children, adults and bemused tourists alike!